My Name is jonathan Mcmillan. I aM an experienced inspiring, transparent professional speaker, trainer, coach, facilitator and role model for audiences young and old who want to be empowered to build and live a quality of life they never even knew was possible. I am a native son of Denver with roots that spread all over the metro area. I am first and foremost a father, son, husband and brother. Because of my first-hand experiences with gangs and crime other challenges I faced in my youth and as a young adult I am also a passionate mentor, author, journalist, activist and advocate for many causes including the empowerment of young people of color through personal development and mentoring and reforming the criminal justice system, particularly the juvenile justice system. I am the founder and director of Be Better Than Average, a company that provides success skills & personal development training through mentoring and life coaching services. I have developed a curriculum designed to help people of all ages and backgrounds to achieve their ideal selves and live the lives they only dreamed about through goal setting, empowered mindsets and forming deliberate, intentional relationships and associations. With over 25 years of community involvement with organizations like Open Door Youth Gang Alternatives, I have demonstrated a lifetime commitment to the success of young people. I facilitate mentoring programs and goal setting workshops. . I have closely partnered and worked with several government agencies, non-profits and grassroot organizations and community based organizations from the Denver metropolitan area including the My Brother's Keeper Initiative, The ROCK Center, Aurora Public Schools and the Cherry Creek School District. 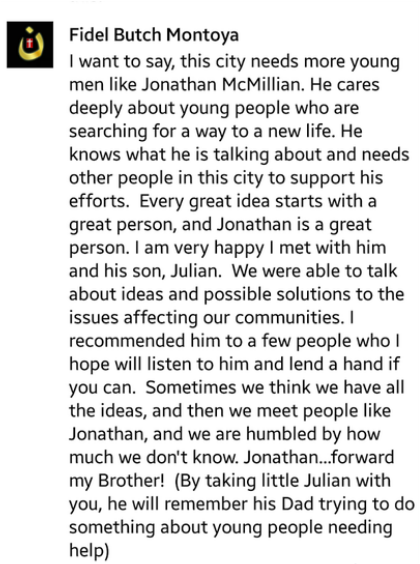 "Jonathan was skilled, poised, purposeful, and focused in the information that was being presented. Schedule a consultation with me to learn how I can help you or your audience reach your goals! Are you looking for a coach to help you achieve your goals? Do you need a speaker to inspire your students, employees or loved ones to be better than average? Are you planning a forum and need an experienced, knowledgeable facilitator to stimulate meaningful conversations that yields ideas and results? Would you like your staff/ faculty to learn how to perform more efficiently and effectively? Contact Jonathan today to get one of the best professional speakers in the business!